Preheat oven to 400°F, setting rack to upper third part of oven. In a large bowl, using your hands, gently mix together first 10 ingredients. Shape into golf-ball size balls and place a few inches from each other on a foil-lined baking sheet. In a small bowl, mix one spoonful of your pizza sauce with olive oil. 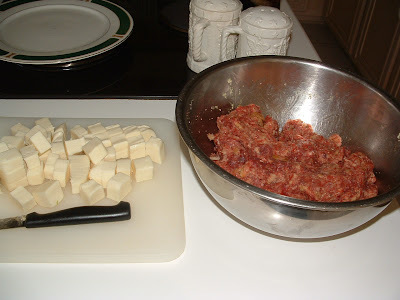 Brush this mixture on top of each meatball. 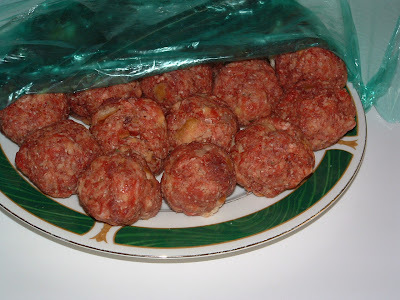 Remove meatballs from oven, spoon some sauce on top of each meatball, and cover each with a slice of cheese. Broil another 3 to 5 minutes until cheese is bubbly and golden. Heat remaining sauce in a small saucepan. Serve meatballs with pasta and a dollop of sauce. 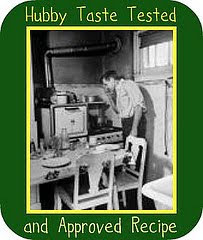 We are a group of home bakers helping each other to achieve baking perfection. Baking partners was begun by Swathi at Zesty South Indian Kitchen. In order to achieve the best results, a perfect recipe and the right techniques are required. We are a small group of home bakers, who love to bake and want to learn more about the tips and secrets of baking and baking well. We are planning to try out recipes from books/magazines and cooking shows. Every member gets a chance to present their choice of recipe and share important points with the rest of the group. The main purpose of this group is to learn the techniques, critic procedures if there are ways to improve and to eat delicious food. 1 (28-ounce) can whole peeled tomatoes or Fresh Tomatoes. Any sliced or chopped veggies of your choice such as capscium, sliced onions, mushrooms. Also you can add paneer or sliced jalapenos or even fruit such as pineapple. I used very thinly sliced mushrooms. Any Meat as you like. Preferable pre-cooked Chicken pieces if you want. It is optional. I used super thin pepperoni just under the cheese. 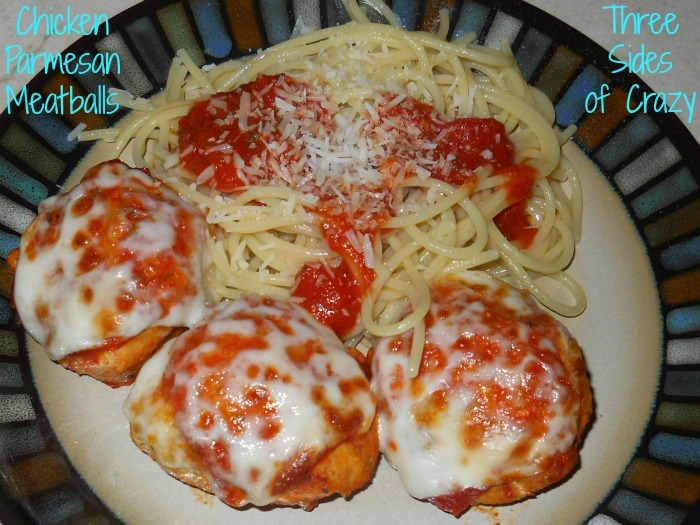 CHEESE – 1 to 2 cups (depends on the size of the pizza) grated cheese – Parmesan or Mozzarella Cheese. 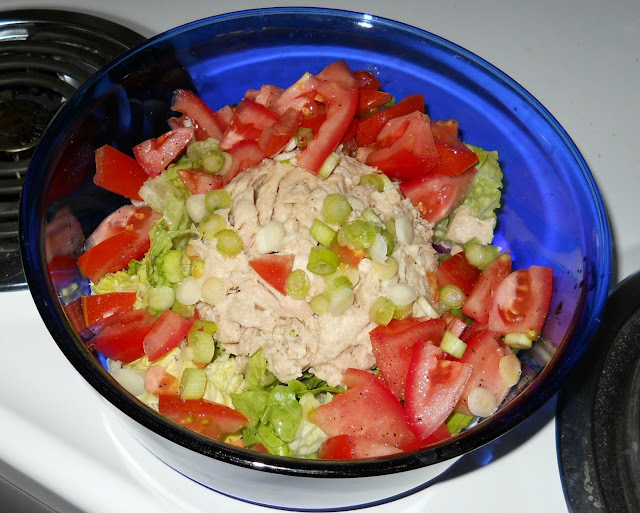 Pulse the tomatoes and their juice in food processor / Mixie until pureed, or puree with hand blender. 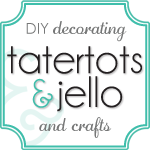 Puree should not be completely smooth, but should have no chunks larger than 1/16 of an inch. Set tomatoes aside. Combine butter and oil in medium saucepan and heat over medium-low heat until butter is melted. Add garlic, oregano, pepper flakes, and large pinch salt and cook, stirring frequently, until fragrant but not browned, about 3 minutes. Add tomatoes, basil sprigs, onion halves, and sugar. Bring to a simmer, reduce heat to lowest setting (bubbles should barely be breaking the surface), and cook, stirring occasionally, until reduced by 1/2, about 1 hour. Season to taste with salt. Allow to cool and store in covered container in the refrigerator for up to 2 weeks. Combine flour, sugar, salt, and yeast in bowl of food processor or in a bowl. Pulse 3 to 4 times until incorporated if you have food processor. otherwise mix well together with the help of the whisk . Add olive oil and water. Run food processor until mixture forms ball that rides around the bowl above the blade, about 15 seconds. Continue processing 15 seconds longer. Those who don’t have food processor. try it with hand mixer or stand mixer or knead it with your hands and how are you kneading like chappati/roti dough. Transfer dough ball to lightly floured surface and knead once or twice by hand until smooth ball is formed. It should pass the windowpane test. Divide dough into three even parts and place each in a covered quart-sized deli container or in a zipper-lock freezer bag. Place in refrigerator and allow to rise at least one day, and up to 5. At least two hours before baking, remove dough from refrigerator and shape into balls by gathering dough towards bottom and pinching shut. Flour well and place each one in a separate medium mixing bowl. Cover tightly with plastic wrap and allow to rise at warm room temperature until roughly doubled in volume. 1 hour before baking, Preheat oven to 400°F. Turn single dough ball out onto lightly flour surface. Gently press out dough into rough 8-inch circle, leaving outer 1-inch higher than the rest. Gently stretch dough by draping over knuckles into a 12 to 14-inch circle about 1/4-inch thick. Transfer to pizza pan. 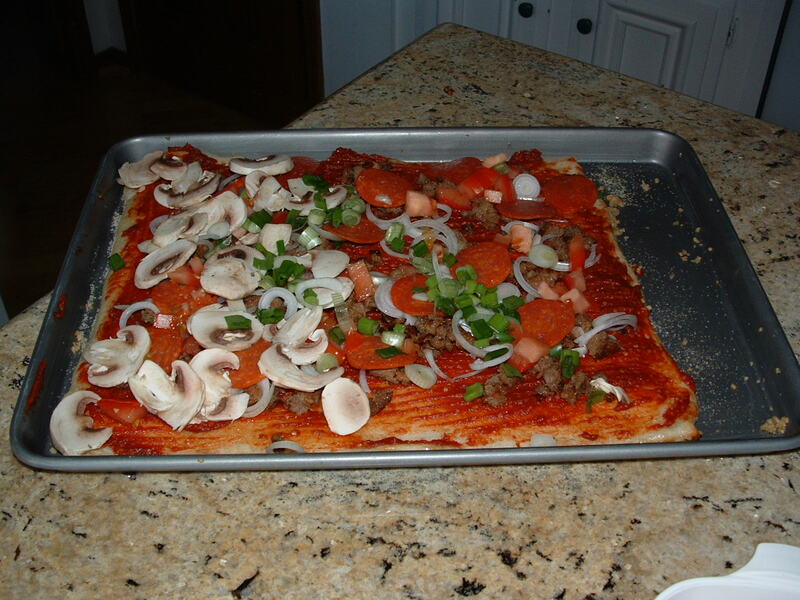 Spread approximately 2/3 cup of sauce evenly over surface of crust, leaving 1/2 to 1-inch border along edge. Add toppings of your choice evenly and spread 1/3 of cheese over sauce evenly. Bake until cheese is melted with some browned spots and crust is golden brown and puffed, 10 to 15 minutes or varies depends on your oven. Transfer to cutting board, slice, and serve immediately. Repeat with remaining two dough balls, remaining sauce, and remaining cheese. In a Dutch oven, cook sausage, ground beef, onion, and garlic over medium heat until well browned. Stir in crushed tomatoes (juice included) and tomato sauce. Season with sugar, basil, fennel seeds, Italian seasoning, 1 tablespoon salt, pepper, and 2 tablespoons parsley. Bring a large pot of lightly salted water to a boil. Cook lasagna noodles in boiling water for 8 to 10 minutes. Drain noodles, and rinse with cold water OR use no bake noodles. 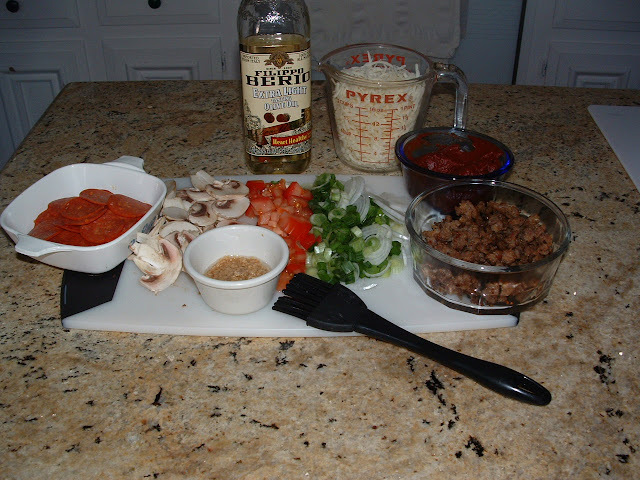 To assemble, spread 1 1/2 cups of meat sauce in the bottom of a 9×13 inch baking dish. My mom got me this new lasgana pan from Chicago Metallic for Christmas and I have to say it is awesome. 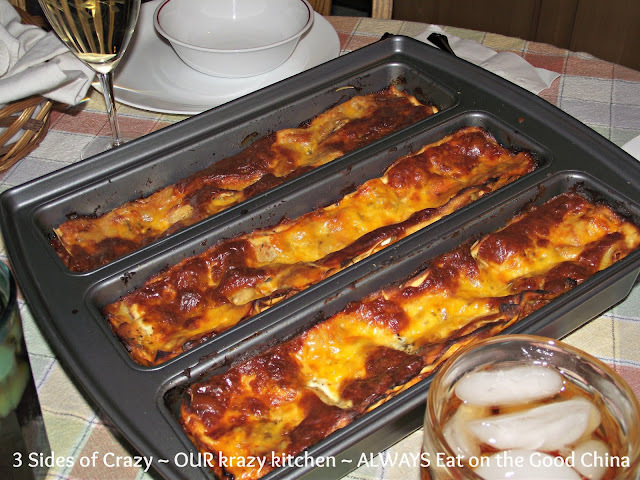 Lasagna no longer is a mess to cut and each edge of cheese is crispy and just perfect! Assembly is also a breeze with no overlapping. You can even make 3 different flavors at once. I can’t wait to try it on some banana bread and meatloafs. I start with whatever vegetables I have in the vegetable bin. 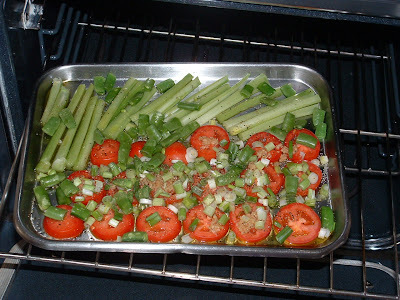 Today was Roma tomatoes, celery stalks, green onions and snap peas. Then I drizzle olive oil and salt and pepper over it all and bake it for an hour at 400 degrees. I started the sauce with a can of Contadina tomato paste, 1 teaspoon Better than Beef Bouillon paste, 2 cups orange juice and a V8. This truly was a clean out the fridge day. 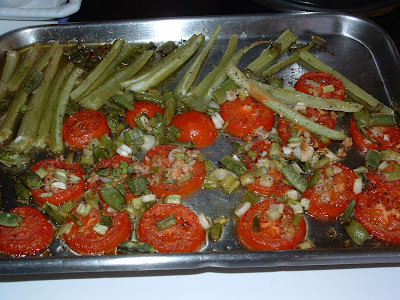 When done roasting add the vegetables to the sauce and set to simmer all day. 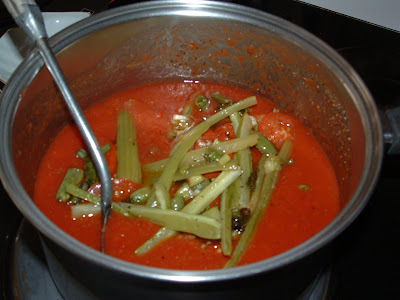 The vegetables will continue to cook down into a uniform consistency with the sauce. Salt & pepper taste. 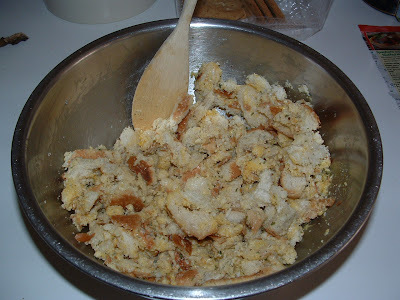 Crumble bread into a large bowl. Toss in Parmesan cheese, parsley, green onions and garlic. Add meat and with your hands mix extremely well until you have a uniform mixture. 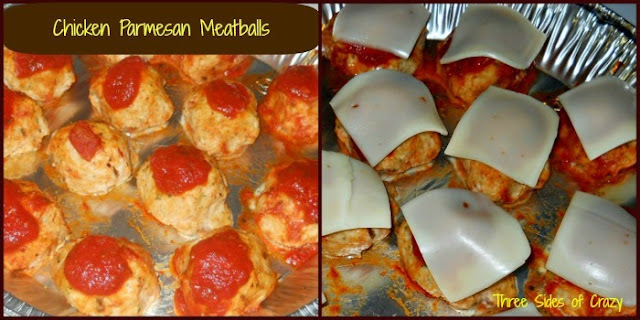 Roll meatballs around a Parmesan cheese cube. Chill Meatballs until sauce is done. Add the meatballs to the sauce and bring to a medium high simmer until meatballs are cooked though, about 20 minutes. 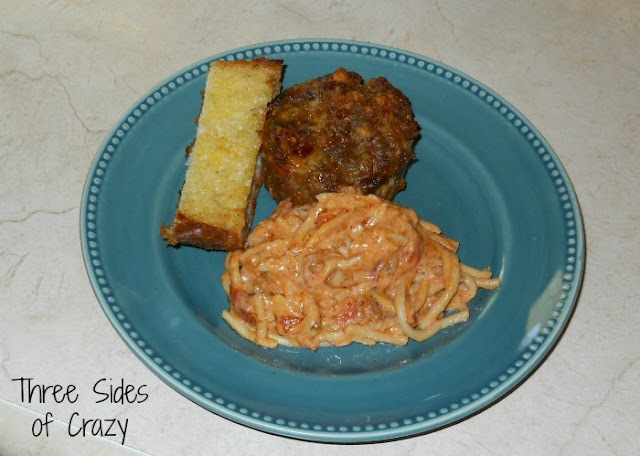 Prepare pasta and Parmesan Cheese Bread while meatballs are cooking. 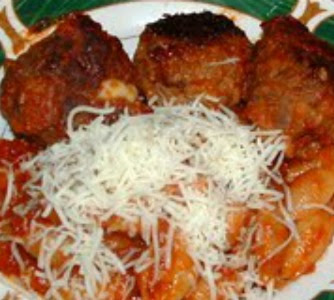 **If you prefer you can add the meatballs directly to the sauce and SLOW simmer for a couple hours instead of browning. I found this recipe at ALLrecipes and it was amazing!! 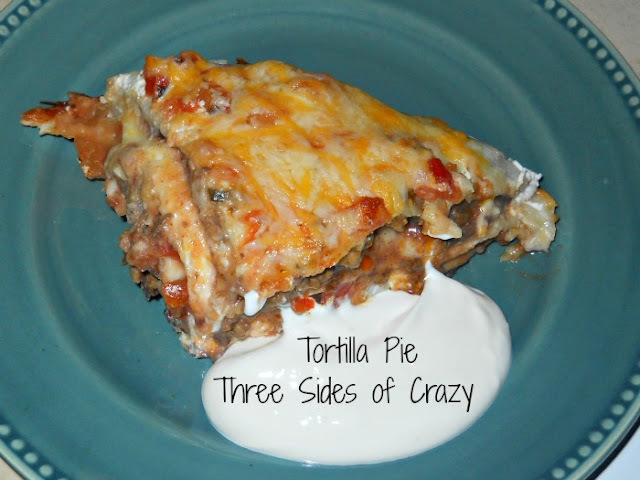 I did make a few changes for my family’s likes so go check out the original recipe. To make the sauce, pour the wine and lemon juice into a saucepan over medium heat. Cook at a low boil until the liquid is reduced by 1/3. Stir in cream, and simmer until it thickens. (TONIGHT DIDN’T WANT TO THICKEN!) Gradually add the butter 1 tablespoon at a time to the sauce, stirring until completely incorporated. Season with salt and pepper. Remove from heat, and keep warm. To make the chicken, heat oil and 2 tablespoons butter in a large skillet over medium heat. In a bowl, stir together flour, salt, and pepper. 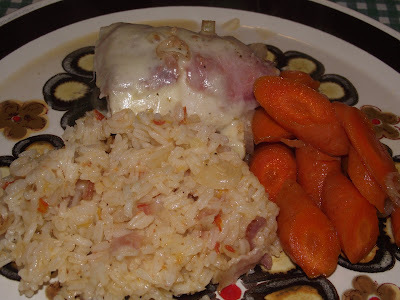 Lightly coat chicken with flour mixture. Without crowding, carefully place chicken in hot oil. 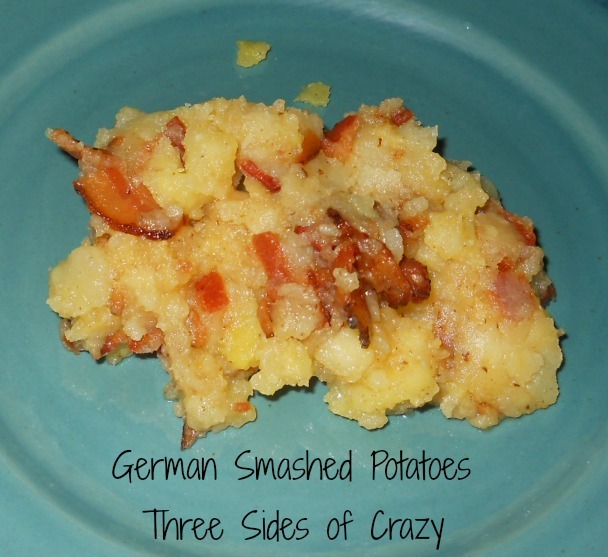 (If necessary, cook in batches.) Fry until cooked through and golden brown on both sides. Remove the chicken to paper towels. OPTIONAL – Stir the bacon, mushrooms and artichokes into the oil; cook until the mushrooms are soft. 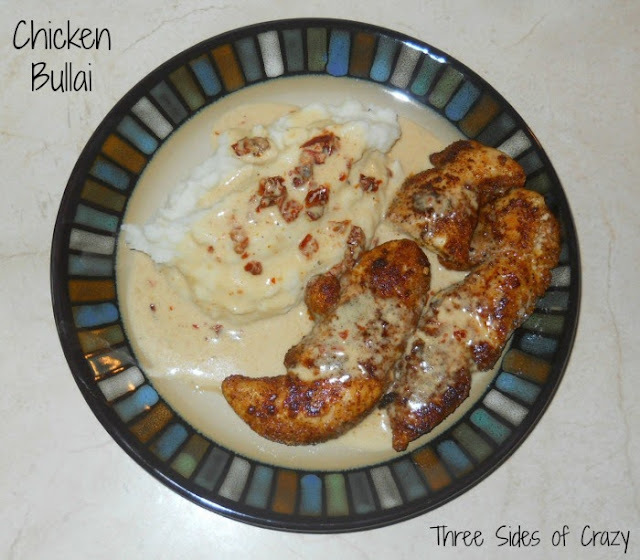 Cut the chicken breasts into bite-size strips, and return them to the skillet. 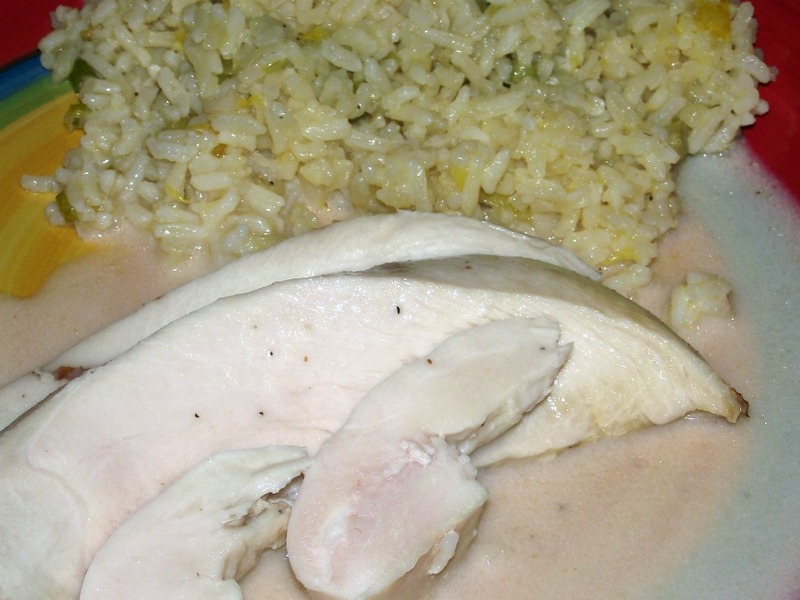 Stir half of the lemon butter sauce into the chicken mixture. To serve, place pasta in a large bowl. Stir the chicken mixture into the pasta. Taste, and adjust seasonings. Stir in additional lemon butter sauce as desired. Toss well, and garnish with parsley. *a dry blush works well also. ❉I didn’t want to use so much butter so substituted 3/4 cup buttermilk this time and was pleased with the results. Whisk together tomato sauce, water, bouillon, garlic, pesto and seasoning. Stir 1/2 cup of tomato sauce mixture and 1/2 cup of cheese into beef mixture. Stuff shells with meat mixture. Pour 1/2 of remaining sauce on bottom of the baking dish. Put shells on top of sauce. Pour remaining sauce over shells. 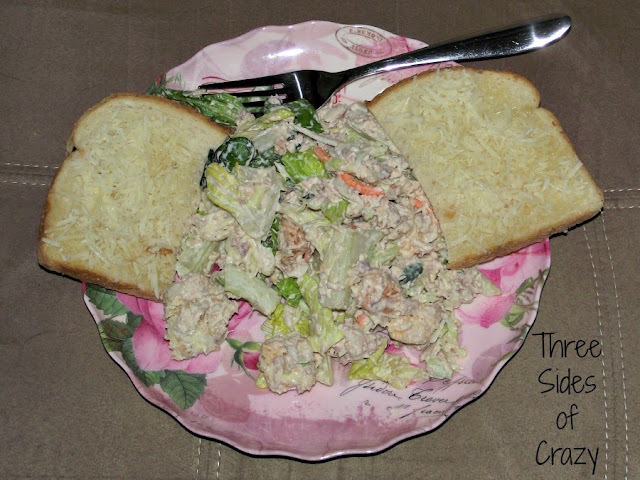 **If you prefer the shells and beef mixture can be tossed and cooked as a casserole. When I do this I use the smaller shells, but same proportions. In a large skillet, melt 2 tablespoons of butter over medium heat. Add garlic and saute until fragrant. Add tomatoes and 3/4 cup of the chicken broth. Simmer 10minutes. Add the cream and bring to a boil, stirring constantly. Reduce heat to a simmer and cook until sauce is thickened to desired consistency. Meanwhile prepare pasta per package directions. In another skillet melt remaining butter over medium heat. Wash chicken pieces and pat dry. Sprinkle chicken with salt and pepper generously. Add chicken to butter and saute on both sides until cooked through. Toss fettuccini and sauce together until well coated. Add to plated chicken. Generously salt and pepper each piece of chicken. In a large skillet melt butter until frothy. Add chicken pieces, searing each side quickly. Drain on a paper towel. Do not discard butter. Warp each piece of chicken in a slice of prosciutto and then lay a slice of provolone on top. 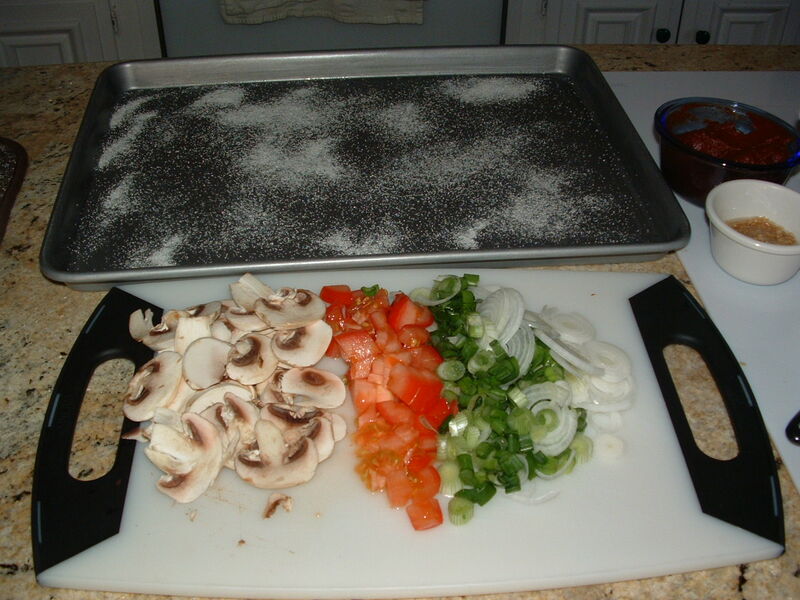 Arrange chicken pieces in a baking dish. In the skillet add the garlic and green onions, sauteing until soft and fragrant. Add the wine and lemon juice, simmering until starts to thicken. Pour sauce over and around chicken pieces. According to Wikipedia STROMBOLI is: a type of turnover filled with various cheeses, typically mozzarella, Italian meats such as salami, capicola and bresaola or vegetables or a Greek Island or an Ingrid Bergman movie – you choose. The dough is Italian bread dough. When I was much younger and elderly family friend always told me I looked just like Ingrid Bergman. I didn’t know then what a compliment that was. Stromboli is reported to have originated in 1950 in Essington, Tinicum Township just outside of Philadelphia, at Romano’s Italian Restaurant & Pizzeria, by Nazzareno Romano. There, William Schofield supposedly gave it the name, after the movie Stromboli, starring Ingrid Bergman. Other sources claim the stromboli was the brainchild of Mike Aquino, Sr., and that he created it in Spokane, Washington, in 1954. The first claim is more credible, with most people remembering the advent of the stromboli at Romano’s Italian Restaurant & Pizzeria in the early 1950s. No matter what you call it, it is a family favorite around here. 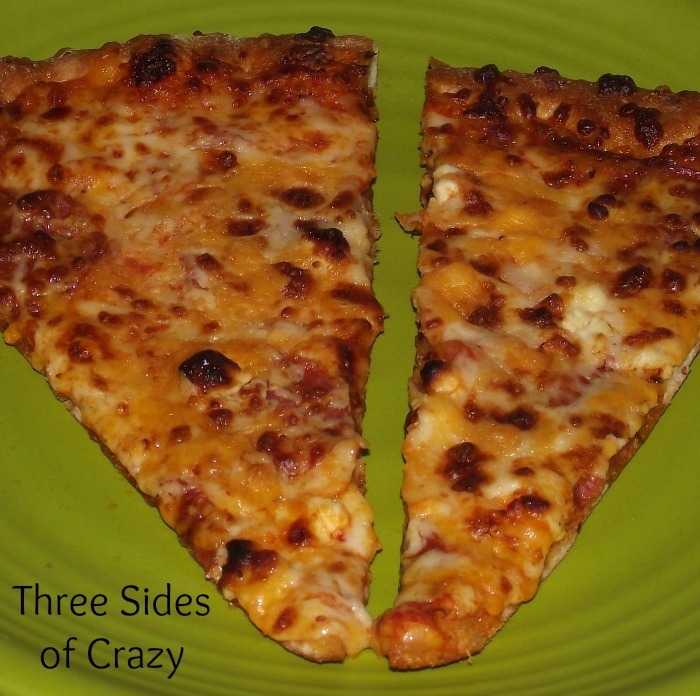 We have a favorite pizza – ITALIAN GARLIC SUPREME from Round Table Pizza. This pizza is full of pepperoni, Italian sausage, Roma tomatoes, white mushrooms, green onions and lots of chopped garlic and is baked with a blend of 3 cheeses in a creamy garlic sauce. Unfortunately they are not a national chain. We have spent horribly disappointing meals out trying to find a local replacement for this pizza. I have since decided the best replacement is the one I make myself. Hubby whole heartily agreed! We decided to push the envelope though and make that same recipe into a sandwich. Put warm water into a bowl. Add salt, sugar and honey and mix well. 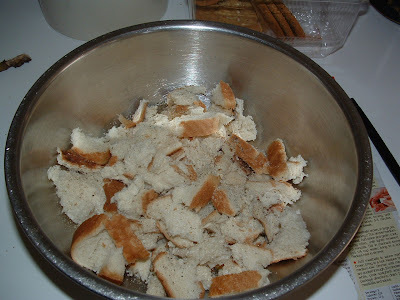 Add the yeast, mix and let it sit for about 10 minutes. Gradually add the flour and olive oil until well blended. When the mixture gets too heavy to mix, start kneading the dough with your hands. Knead the dough until you have a smooth ball. If the dough cracks it is too dry. Add water bit by bit until if forms a nice smooth ball. If you need to add water or flour, do it by small amounts. Coat the dough with olive oil, place it in a large bowl and cover it with kitchen wrap and a flour sack towel. Let the dough rise for about an hour at room temperature, then push it down again so it deflates. Let it sit for about another hour. Either bake it or refrigerate for later use. Put the dough on a lightly floured surface, put a bit of flour on top and make it into the shape of a pie by stretching it out from the center outwards. Use a rolling pin until the dough is about 1/4″ thick. Punch some holes in the dough with a fork to let the air escape while the pizza is in the oven. Lightly oil a cookie sheet with olive oil and sprinkle with cornmeal. Pre-Bake dough at 400 degrees for 5 minutes. Whisk together the tomato paste, garlic and 1 teaspoon olive oil to make the sauce. 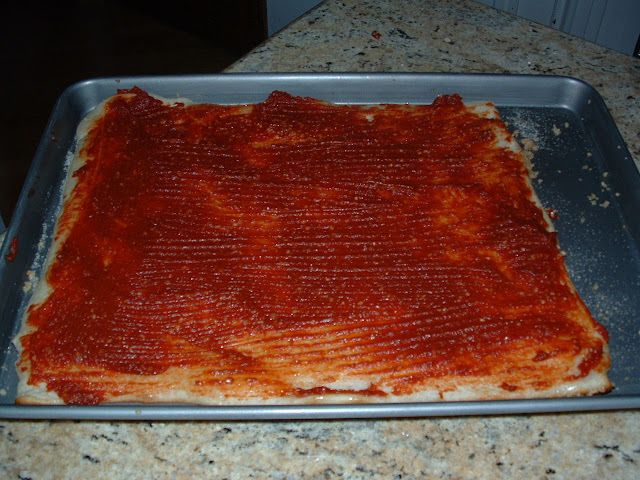 Brush pre-baked dough with a small amount of olive oil and then an even layer of the sauce. Evenly sprinkle the crumbled sausage over the sauce followed by half of the pepperoni. Top with the mushrooms, green onions and tomatoes. Top with the remaining pepperoni. Roll up and place on the center of the pan. 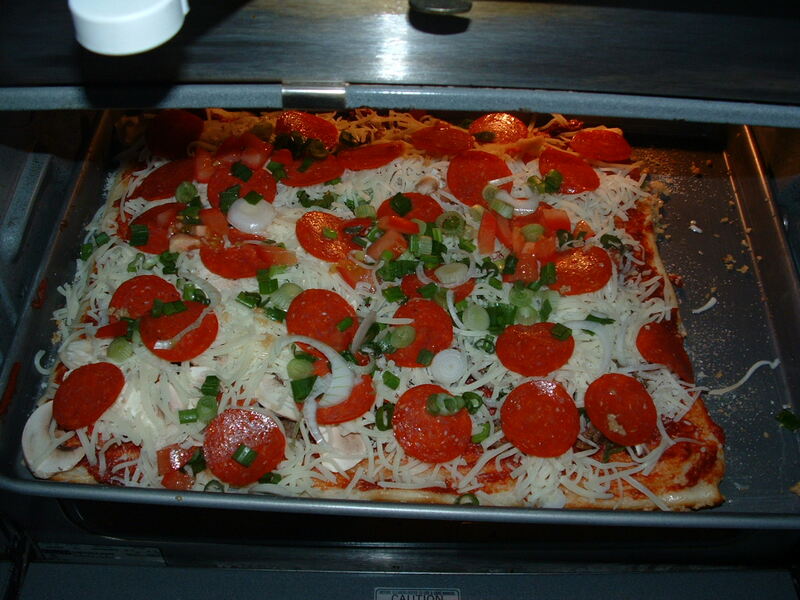 Bake the sandwich pizza at 400-450° F for about 20-25 minutes until the crust is golden.